Autumn! Duh. 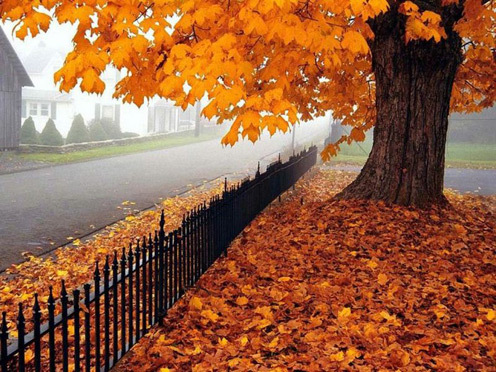 If you haven’t noticed yet, I’m sort of in love with autumn: the crisp air, the leaves, the PUMPKIN! Surprise. 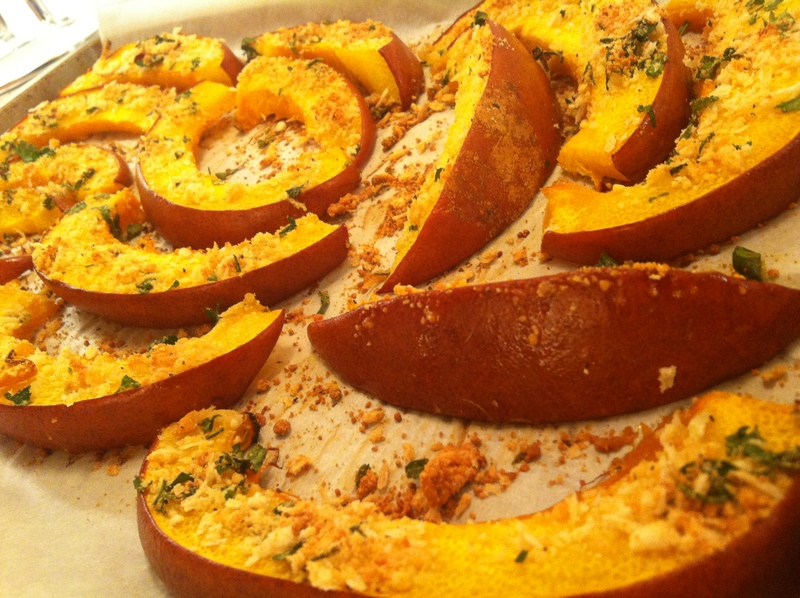 Needless to say, I’m presenting you with yet another pumpkin recipe today: Crusted Roasted Pumpkin. You’ll also get the added bonus of an amazing butternut squash risotto recipe. It’s been a little modified from it’s original form, so you’ll get my slightly-drunk risotto. 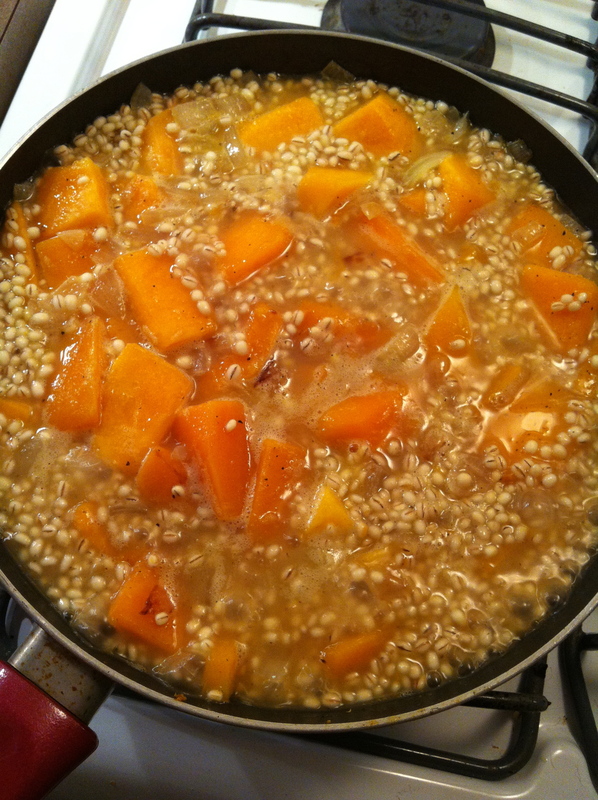 The risotto was drunk, not I.
I should explain a little something about the pumpkin recipe. Unlike most of the things that appear on this site, it wasn’t concocted with nearly-spoiled ingredients. Y’know, all those things you have that you need to finish off so you don’t feel guilty about wasting them? Yeah, that’s the usual. But this? This is something completely different. A long time ago (anything more than one year counts as a long time ago, right? ), I found out about a cook book called Plenty. The photos were amazing. The cover of the book itself is soft, almost velvety. The paper is wonderful. Have you noticed that I’m a book and paper person yet? Anyway. Two weeks ago was my friend’s birthday. We work together. Another friend brought her birthday presents to work, and brought me a little something, too. Neatly wrapped in lovely plain brown paper, something slightly soft and rectangular… A book. Oh, I know what a book feels like… Holy cow. HOLY MOLY. OH MY GOSH! Plenty. It is from this book that I yanked the pumpkin recipe below, and you’ll get plenty more where that came from (Hah, see what I did there?). 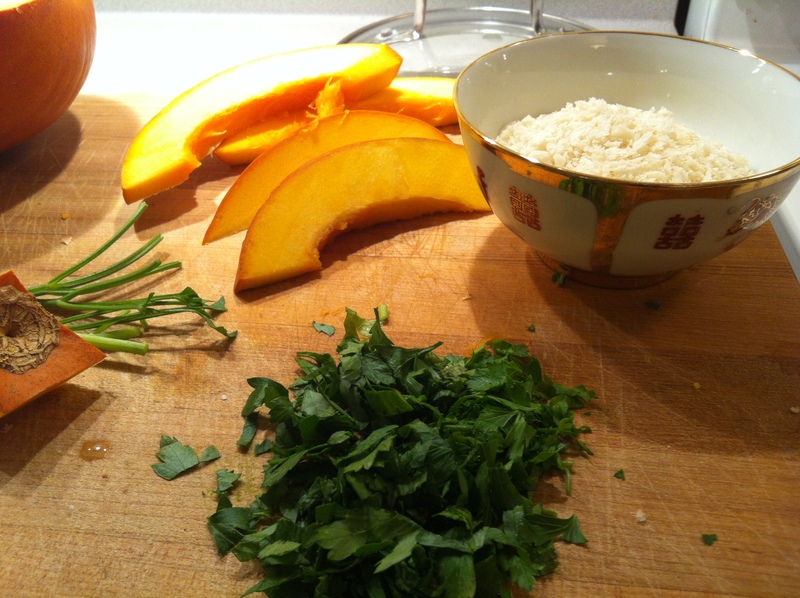 The butternut squash risotto, however, is another story. A more typical story. The type of story where inspiration came from a handful of mismatched recipes, and yet another moment of intense procrastination. Thesis? Editing? I’m gonna make me some food! And so I found myself picking through chunks of half-spent squash, shuffling through my pantry for some barley I could swear I didn’t have… but thank goodness, did! 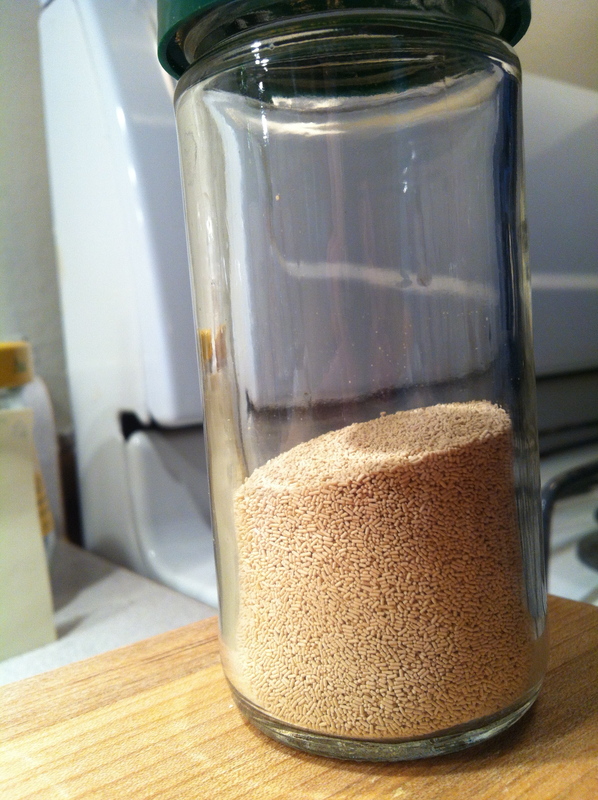 Someday I really have to label those glass jars full of grains. About an hour later, a lovely steaming pot of vegetables and grains and cheese stared up at me from the stovetop. Of course, by the time I finished making it, I wasn’t hungry anymore, so it went into tupperware and perches in the fridge for lunches later this week and a couple of hungry friends! Slice open and de-seed the pumpkin. 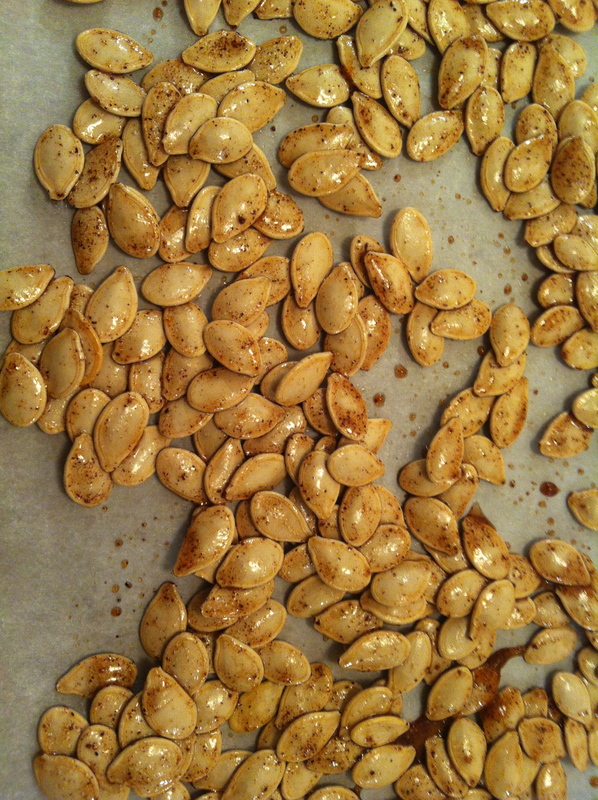 Set the seeds and guts aside for roasting later. 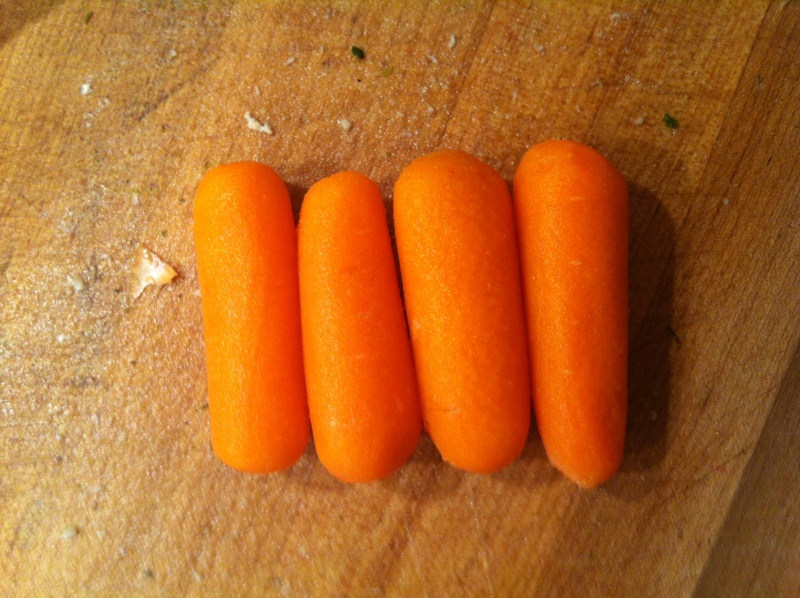 Cut the halves into 1 to 1 1/2 inch slices and lay them out on a baking sheet. Brush the pumpkin with the olive oil. 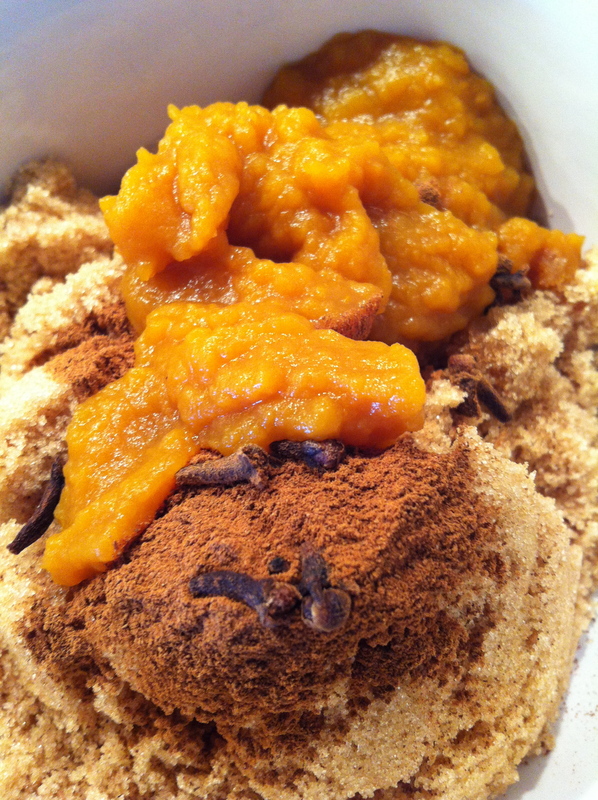 Mix together the remaining ingredients and sprinkle on top of the pumpkin slices. Press down lightly with your fingers so they stick to the pumpkin! Pop those babies into the oven for 30-45 minutes. I cut my slices thinly, so it only took 20 minutes or so for mine to finish. While the pumpkin is in the oven, mix the sour cream and dill if you’re making the dip. 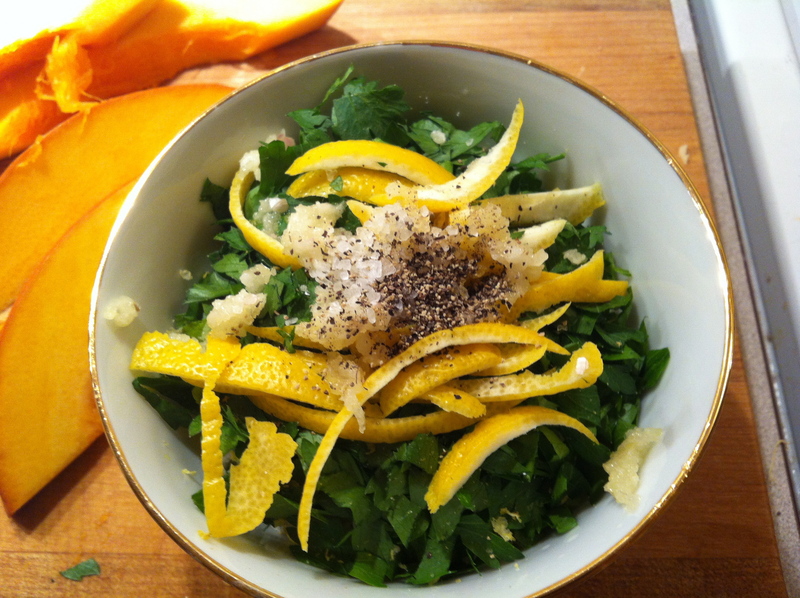 It definitely complements the lemon and parmesan. Chop the onion and toss it, with the olive oil, into a pan. Add the squash and cook until the onions start to become clear. Keep stirring. Let it cook for 5 or 6 minutes. Add the salt and pepper. I think the less the better — you can always add more later. Add the white wine and cook, stirring, for one minute or so. Add the stock and bring it all to a boil. When it boils, either cover the container and stick it in the oven or, if the container isn’t oven-safe, dump it all into a casserole dish and cover it up. Stick it in the oven for 30-45 minutes, or until the barley is cooked through. 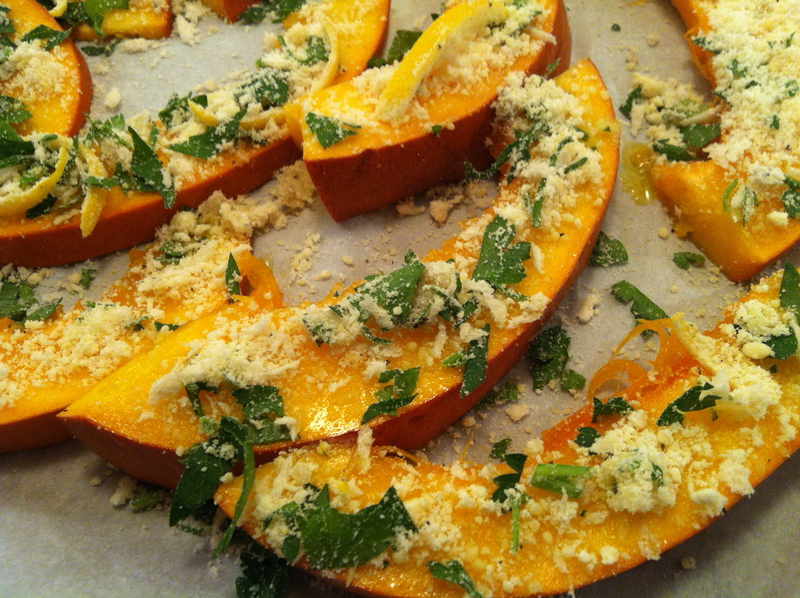 Remove the dish from the oven and mix in the cheese, parsley, and spinach. 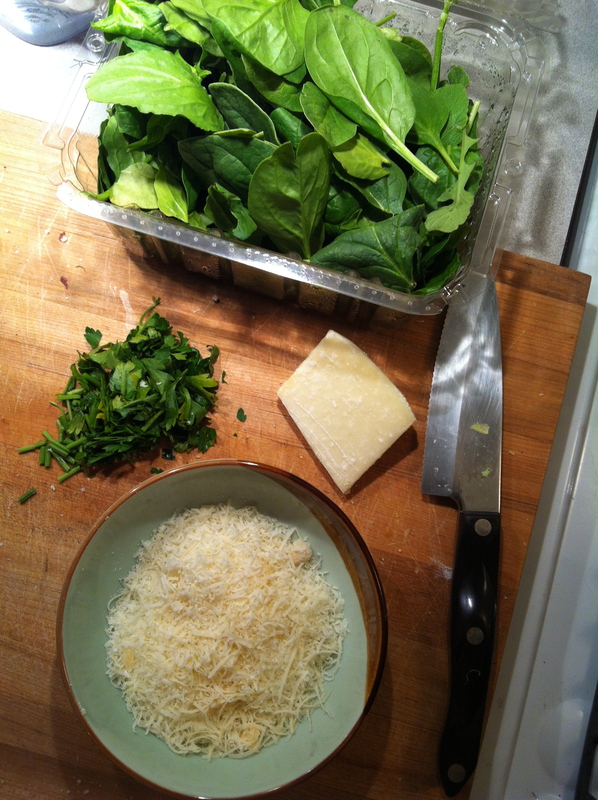 The spinach will wilt, the cheese will melt, and you’ll stuff your face. Enjoy! 1. honey, cinnamon, cloves, nutmeg, and ginger. 3. the traditional route: salt. More more more more more… And no, I’m not talking about soup anymore. That’s so last Sunday. I’m talking about pumpkin. Pumpkin everything. A couple of weeks ago, I did the pumpkin latte thing. 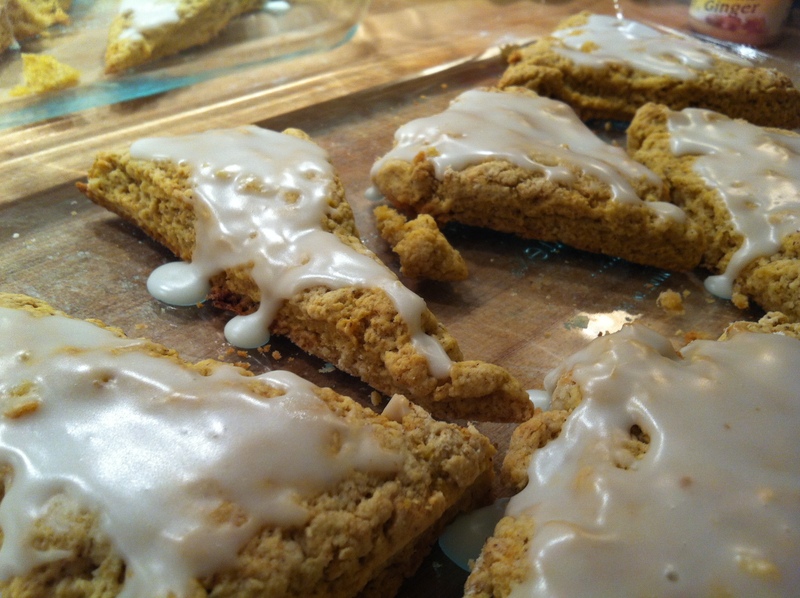 This week, I’m doing the pumpkin scones thing. It all started with a wonderful couple of German-speaking friends. Just a handful of months ago, they announced it: Baby time! Fortunately for those of us who don’t want them to fly back across the pond, the baby is due at about the same time and bought us another 6 months or so with them. Either way, my coworker is leaving for the whole baby-having process, so we’re throwing them a little baby shower/going away party. What’s more appropriate at a 9:30 am party than coffee and scones?! 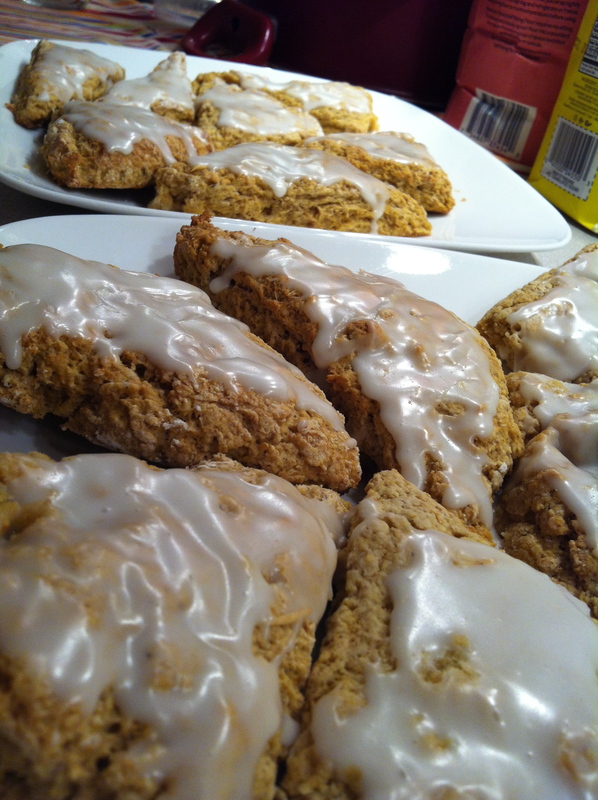 So, naturally, the choice was pumpkin scones. Do they do the pumpkin thing in Germany? I’m sure they do. They must. Who doesn’t do pumpkins around this time of year?! Alright, I’m sure there are plenty of people who don’t, but we’re in Amurica. The only question left: How the heck am I going to get all of these things to work without screwing up their pretty icing?! Preheat to 425 F. Stick some parchment paper on a baking sheet. 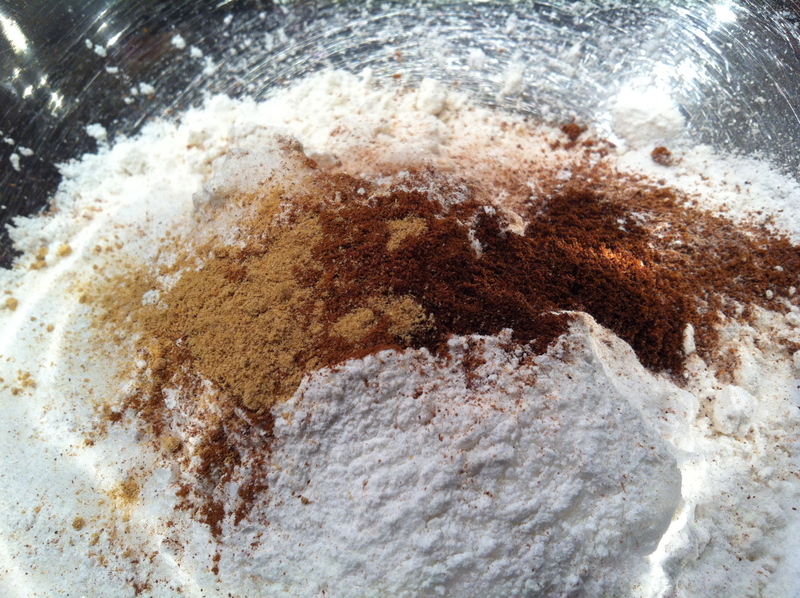 Mix the flour, sugar, baking powder, salt, cinnamon, nutmeg, cloves, and ginger. Add the butter and toss and mix with a fork to break it up into itty bitty bits. 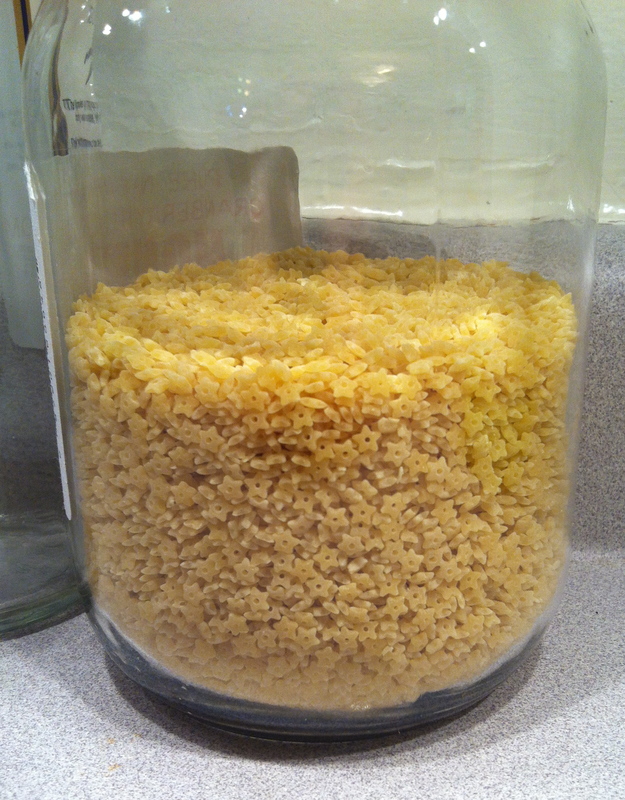 The mixture should look kind of like cornmeal, then you can stop mixing. 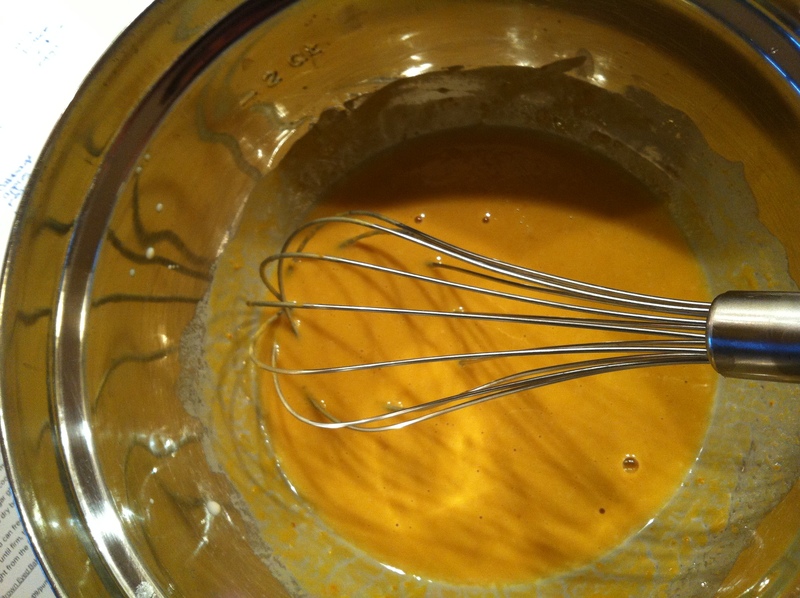 In a different bowl, whisk the pumpkin, half-and-half, and egg together. 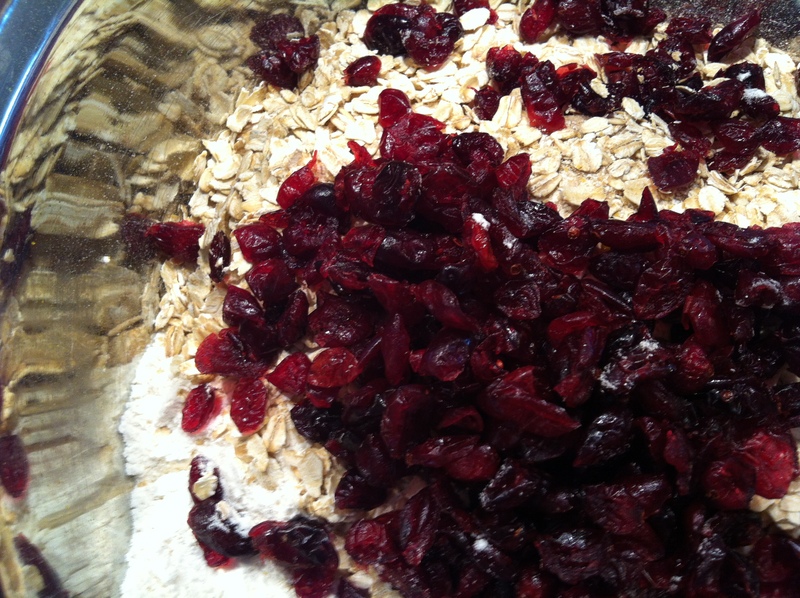 Pour that into the bowl with the dry ingredients and mix it all together. Lightly flour the counter (or some other surface), and slap the dough onto it. pat it out so it’s about one inch thick, four inches high, and twelve long. Then slice it into three equal portions. Slice an X into each section, so you now have 12 triangular pieces of dough. Stick ’em on the baking sheet and bake them for 14-16 minutes. Yank ’em out and get ’em cooling. While the scones cool, whip up the boring frosting. Yep, just mix the ingredients together until smooth, and when the scones are nice and cool, spread that stuff on there. Let it set/harden a little (30 minutes or so). Whip up the spiced frosting next, and drizzle it over the iced scones. Happy first day of Autumn. I can think of very little in the world that announces its presence more than pumpkin, soup, and crunchy leaves. With that in mind, I’d like to share a little sum’n sum’n with you: pumpkin, soup, and crunchy leaves! For the past week or so, it’s been a little nippy in the mornings — early mornings, that is. I’m up and out the door to be at work by 6:30 three days of the week. Having an excuse to wrap up in a scarf is more than I could have hoped for in last year’s heatwave. The first day of wearing a scarf is usually heralded by none other than a pumpkin spice latte. Yes, I indulge. More regularly than I should, really. That must be why two weeks ago, I just needed to learn how to make it on my own. So I did! As usual, the link is posted below (since I used someone else’s recipe). Now, let’s get back to this soup business. 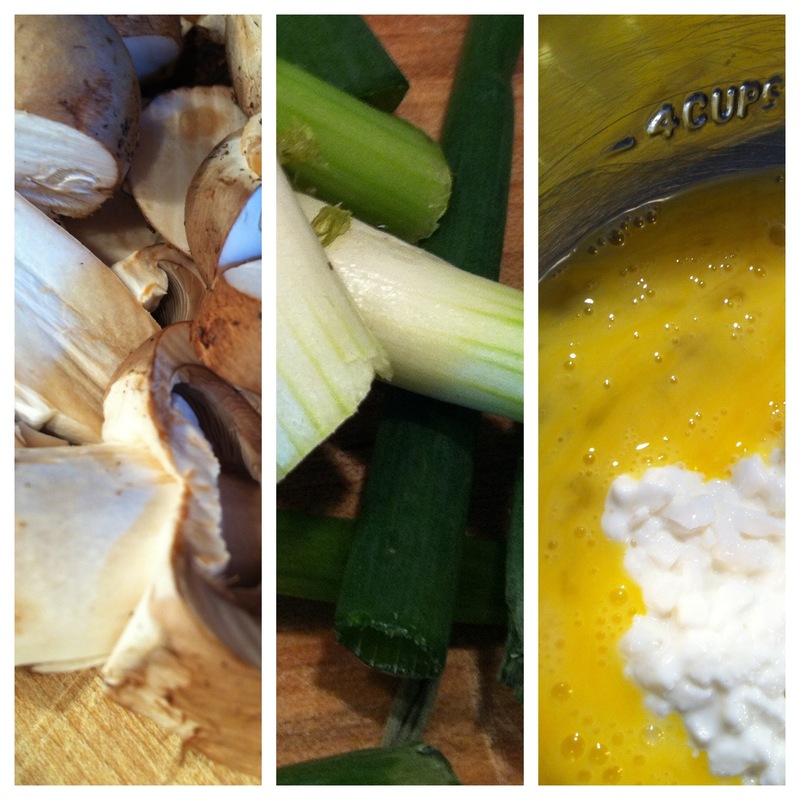 For weeks, I’ve been itching to get back into the kitchen and make some kind of soup. The delicious kind. Every kind. The best kind. Creamy. No, brothy and packed with vegetables. Oh, even better, ridden with barley and beef stock! Lentil-based? Split pea! Chicken broth! Lemongrass and coconut milk! More! Wait! I could almost hear MaryEllen’s voice. No wine? Just who do you think I am? How… uncivilized. So. You can guess what happened next. That, by the way, is what happened to me, not the soup. Moving on! What’s soup without some spices, eh? 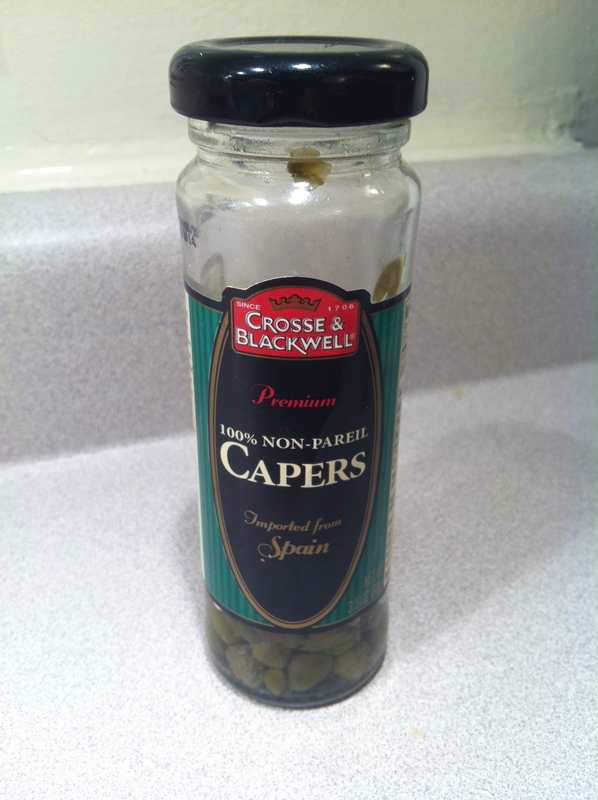 Dill, bay leaves, peppercorns… No peppercorns? Ground pepper it is, then. A handful of dried red pepper flakes, just for a little interest. That should do. A little more salt, maybe. And mushrooms. More mushrooms. Last but not least: the stars! Fill a large pot half full of water. Add some salt if you want it to boil more quickly (and for flavor!). Add the chicken breasts (I cut them up later). Roughly chop the onion and garlic. Throw it in. Add the spices (dill, red pepper flakes, and black pepper). 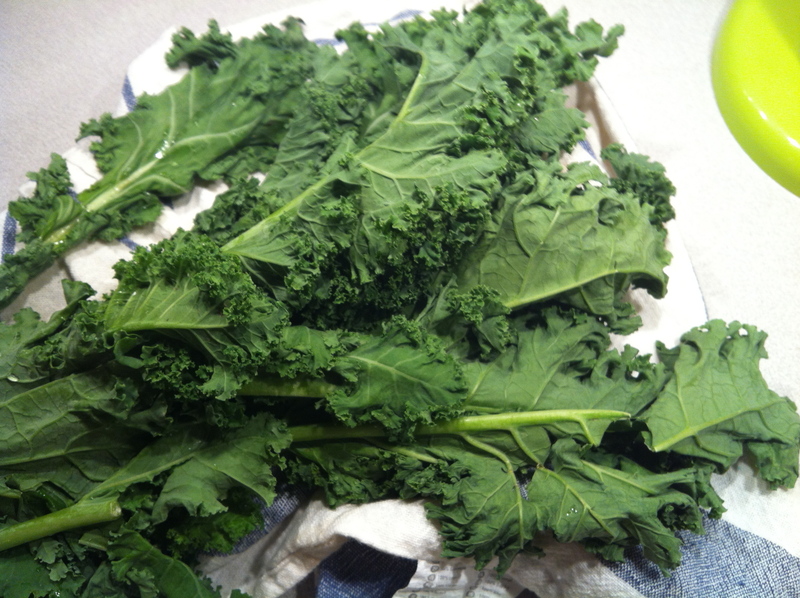 Chop the carrots and strip the kale from its stalks. Toss them in, too. Give it a good stir, and let it boil until you’re happy with it (45 minutes-1 hour). Read the instructions on your noodles. 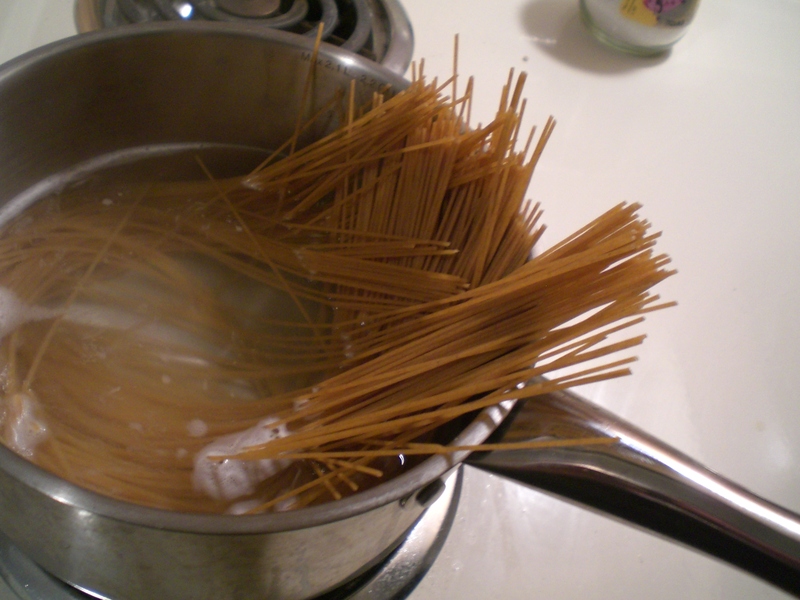 My stars only took 7 minutes before al dente, so instead of putting the whole box of pasta in the pot, I threw some into the bottom of my bowl and poured the soup on top. It’s summer, so if you follow this rag-tag blog at all, you probably know what that means: Greece! Not just a holiday to the Aegean, but real, hand-over-my-heart work. Of course, it’s not all work. Dinners at this little hotel on a quiet street on East Crete are most certainly not work. You may need to do some work to make sure your waistline doesn’t blow, but they serve some of the most delicious chicken and potatoes I have ever eaten. Yes, you heard me. Chicken. And. Potatoes. 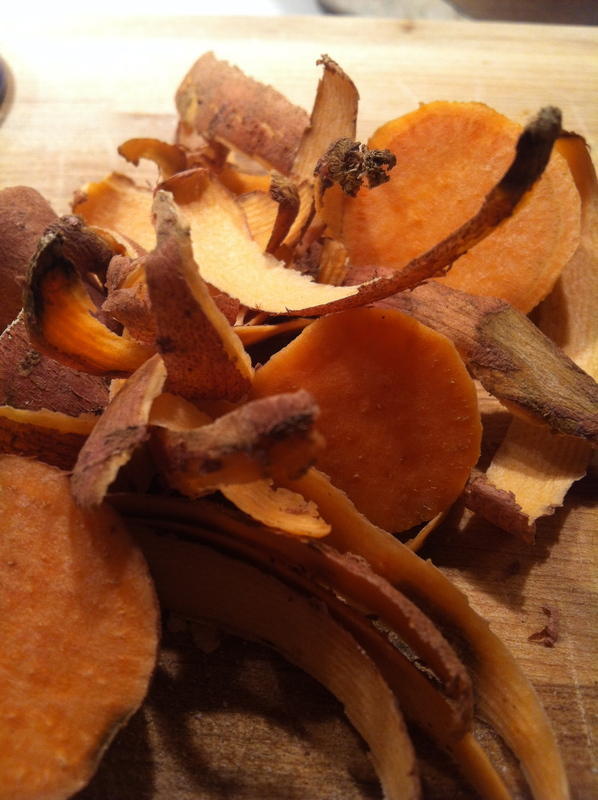 Chop it all up (well, that which you can chop) and throw it all together in a bowl. 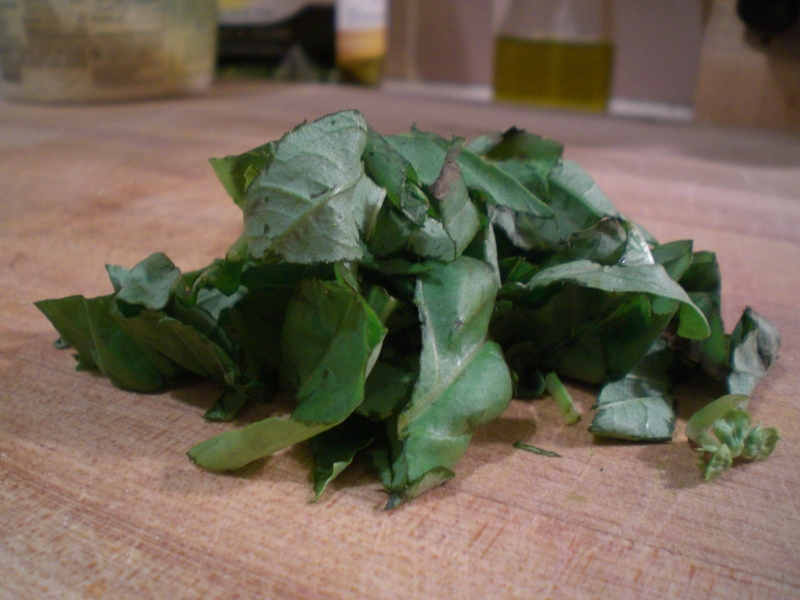 Dress with the ingredients that are left unchopped. Eat it. 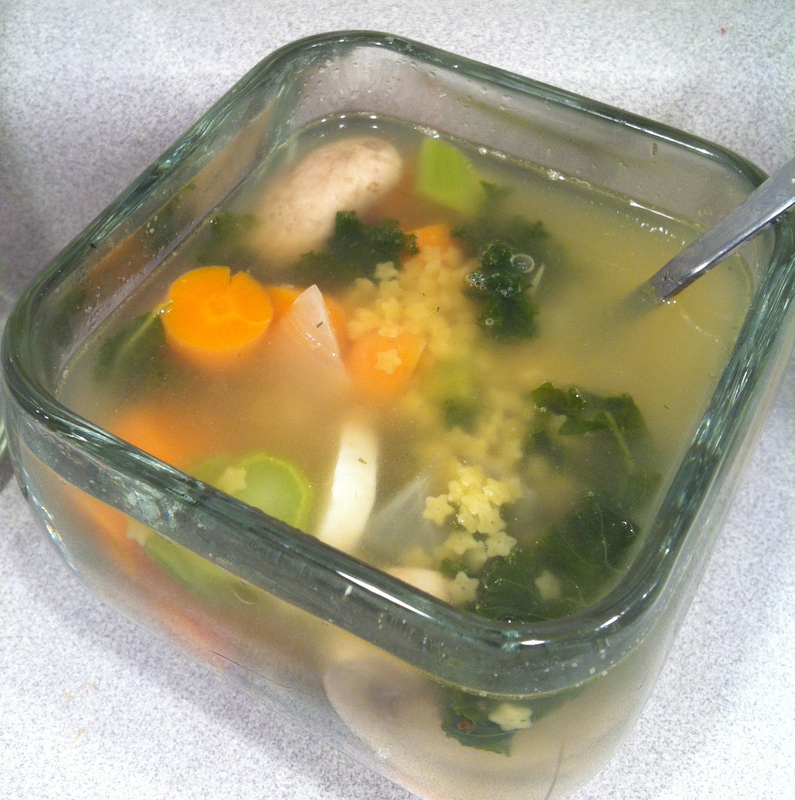 All of the ingredients above, plus two cups of quinoa, prepared in vegetable or chicken stock. 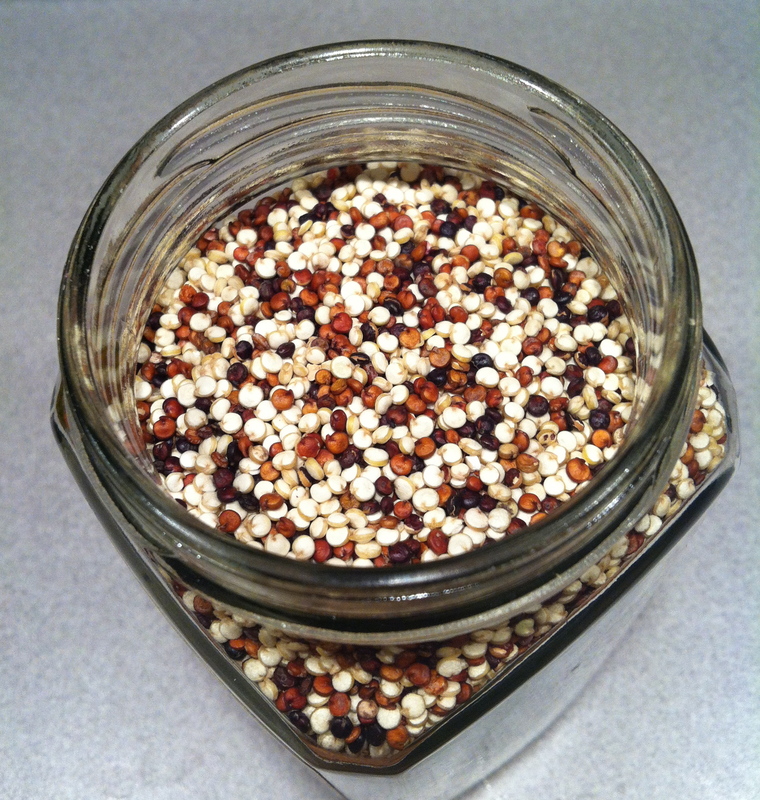 When the quinoa is nearly finished cooking, dump the contents of the salad into the pot. 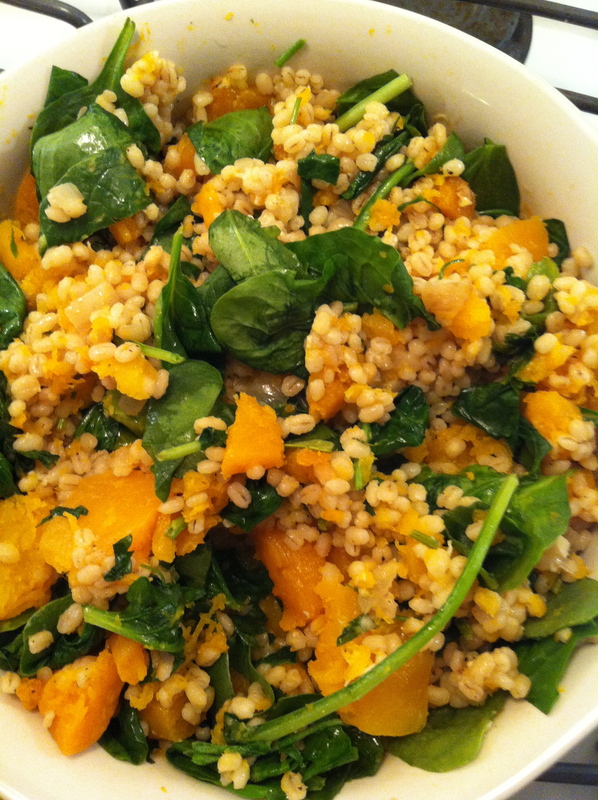 I try to always add handfuls of spinach, since it makes the dish a little prettier. PS: These are older photos that I’m trying to make sure to use up while I’m in Greece, and have the time to blog. Apologies if they’re not the best — there’s a reason I didn’t use them when I was still at home. I promise better photos upon my arrival to the states. I have a dirty little secret for you, and I’ll give you just one guess what it’s about. A while ago — a long while ago — I made Peach Bourbon Hand Pies a la Deb (yet another Smitten Kitchen creation). Lately, I’ve been into roasting the living buh-jee-vas out of vegetables. Put ’em together and whaddaya get? 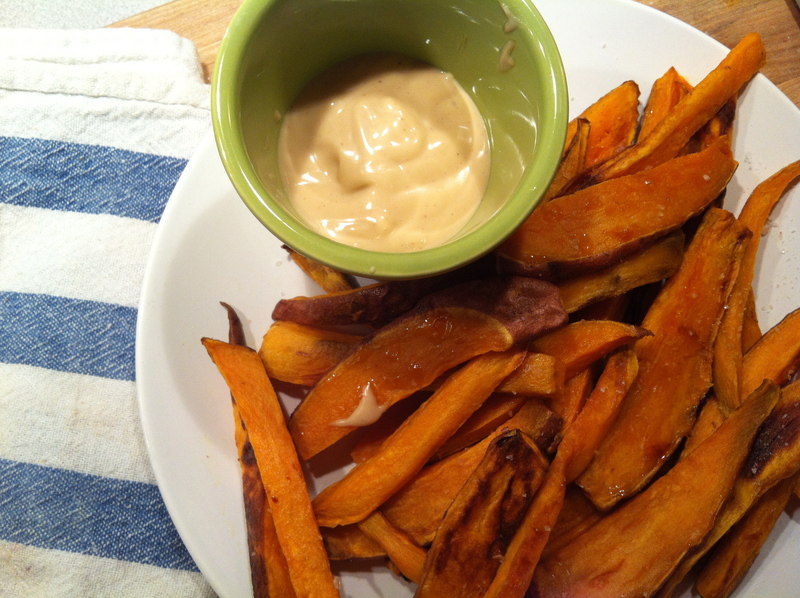 Sweet potato fries with a sinful vanilla bourbon dipping sauce. Okay, okay. So I didn’t come up with that on my own. Two weeks ago, a friend and I went to Iron Hill brewery for lunch. After two failed attempts at getting our order straight, our cute (but very Jersey Shore) waitress smacked her gum and dropped off a plate of three dipping sauces, on the house. My friend is rather charming, you see. The first one: jalapeno something-or-other. Not impressive. Up next? 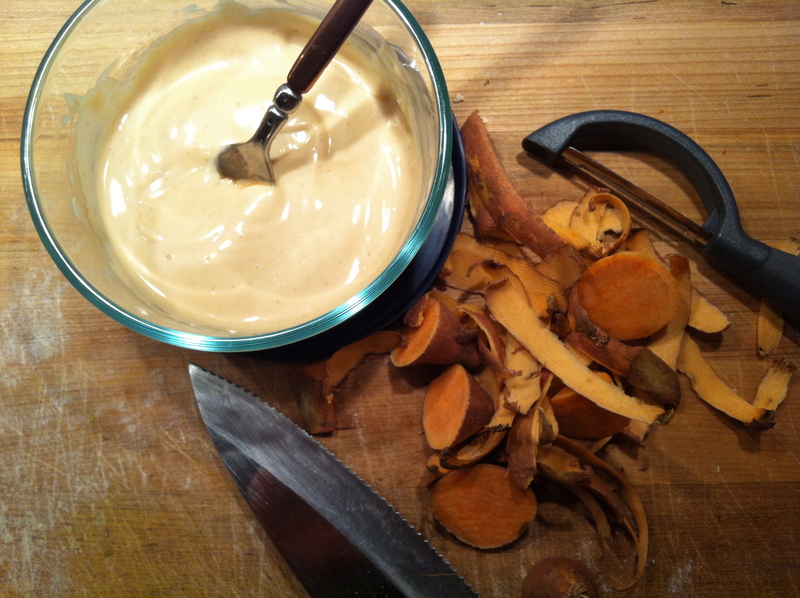 Smoked Paprika Mayo. Alright, but bland. Finally? A meek, beigey-creamy goo, barely darker than the color of the ramekin. His mouth fell slightly open, the way it does when he sees a painfully attractive woman. “What… What is this? … This… is… delicious!” Between nearly-open-mouthed chewing. The waitress came back. He wanted more. And more. And more. Two days later, we went back. For more. He wheedled the ingredients out of her, but not the proportions, and I’ve been working on it ever since. This recipe’s a little slap-dash (in the cooking sense), if you know what I mean. It took almost three weeks, but here it is. I hope you enjoy it as much as my friend and I do. Prepare the bourbon if you’re going to do that. It tastes best that way. Slice the sweet potatoes into chips or fries, just make sure the pieces are approximately uniform, so you won’t have some pieces overcooked and some undercooked. 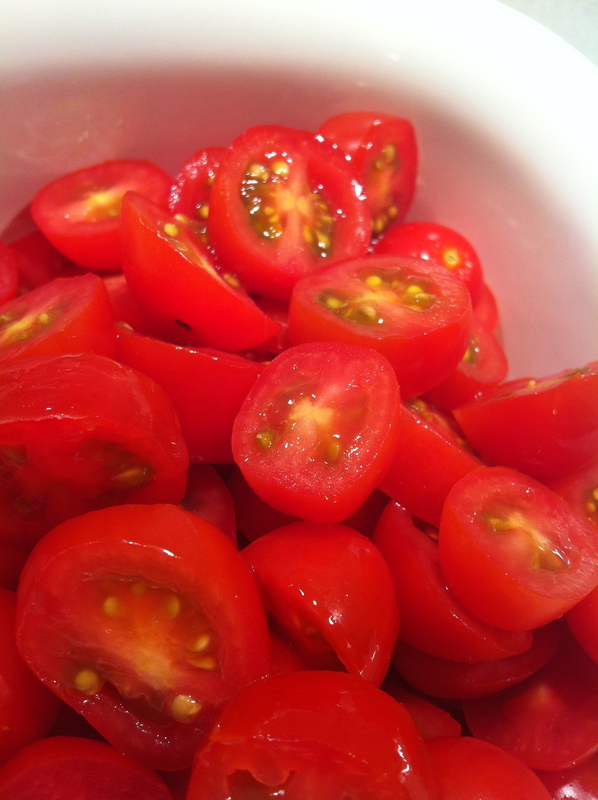 Toss the pieces in a bowl with the salt and olive oil, and then lay them flat on a baking sheet. Bake for 15 minutes, flip, and bake another 15 minutes. Cool for at least one minute before serving. Those boys are hot! Note: I think this would be absolutely delicious on french toast, pancakes, waffles, toast, fruit… almost anything. I have always wanted to make bread. I don’t mean buying a little bag of pizza dough from Trader Joe’s and plopping small pieces into a muffin tin with a little olive oil. That’s just cheating your way to kind of crappy rolls. I mean, I want to mix flour and water and yeast. I want things to rise. I want that delicious smell, first thing in the morning (or right before dinner). I want… I want… I want to make bread. Luckily, I have a friend at work who is a culinary genius (all natural, all delicious), and she let me take a quick looksie at her bread cook book, and even brought me a little vial of yeast. I copied a cliff notes version of the “Master” recipe, and headed home. The book, worth a mention, is called something like, “Fresh Bread in 5 Minutes a Day” or something — it’s brilliant. The idea is that you make a bunch of dough when you have the time, and then break off hunks and bake them as you need them. Perfect, right? So yesterday morning, I threw everything together, gave it a quick stir, and let it sit on the counter for two hours — apparently, this is a secret. Shhhhhhh! Then, into the fridge for at least 3 hours, but the longer the better. I had so much to do, so the bread would have to wait until this afternoon. 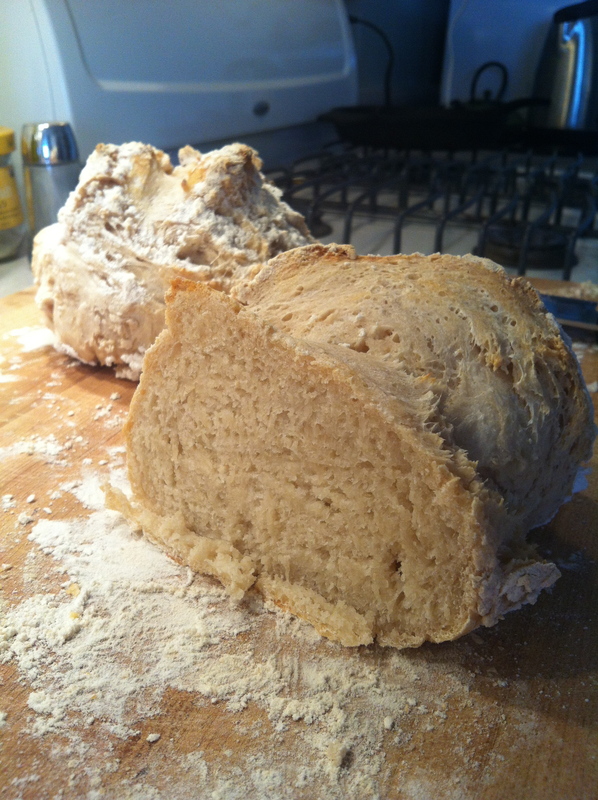 Luckily, the longer the dough stays in the fridge, the more complex the flavor becomes as the yeast… does yeasty things. With that done, I had to take care of some other things that kept me busy until this morning. Making bread is so easy! It’s ridiculous. sprinkle a little flour on the top of what’s in the bowl, break off a hunk, and let it rest for a little while before popping it into the oven. Then, voila! Fresh, warm, delicious artisan bread. The next adventure: figuring out how to put crap in it. 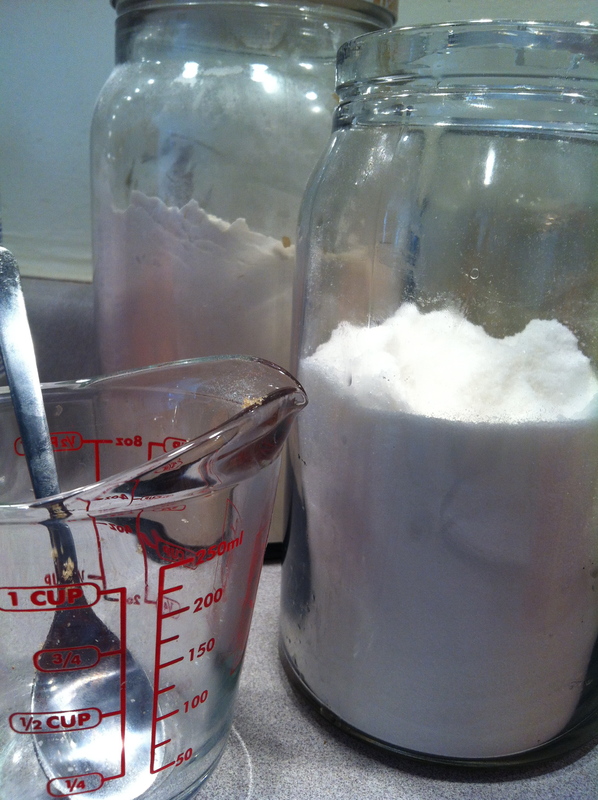 Mix the water, yeast, and salt. Add the flour to the mix and mix until it isn’t lumpy. We’re going for homogeneity, here. Here’s the easy part: Let it sit on the counter for two hours with a lid or saran wrap on it. Be sure that it’s not airtight. Gasses need to move around in there. After two hours, pop it into the fridge for at least 3 hours. The longer it sits, the more complex the flavor will become. Then lightly dust the top of the dough that you plan to cut off from the rest to bake, and then cut it off. 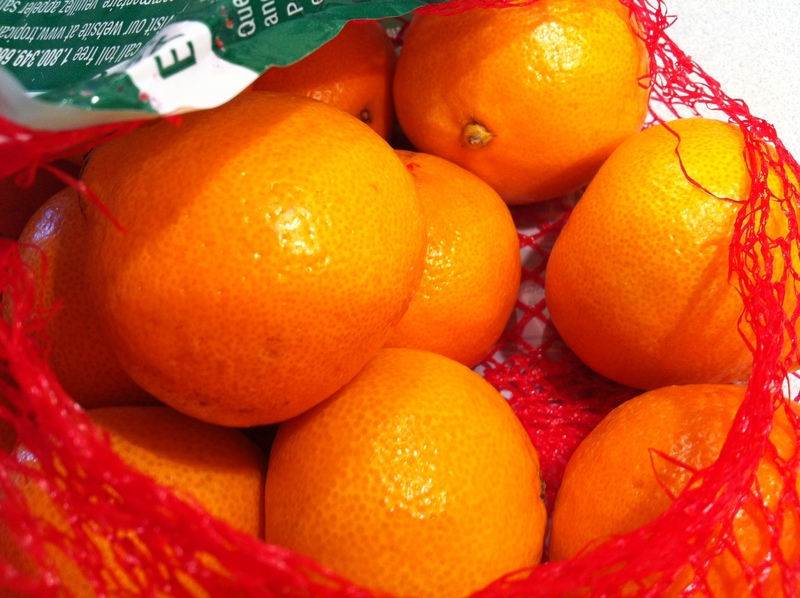 You want it to be about a pound, or about the size of a grapefruit. Next, use your thumbs to stretch the top layer of the dough around to the bottom of the loaf, little by little. The bottom of the loaf should look a little pinched when you’re through (this should only take 30-60 seconds). Plop that baby down on a nice layer of flour (either on a bread stone or a tray, doesn’t matter) and let it rest for 40 minutes. Put an oven-safe container into the oven to warm up. Put it on the bottom rack, with enough space between the top of the container and the rack above, so that you can add some water to it in a minute. When the dough has rested for 40 minutes, dust the top with flour, give it a quick slash across the top with a sharp knife (to get those neat lines), and stick it into the oven. Now, add a glass of water to that hot container below the bread. It’ll steam, so be ready. Shut the oven door, trapping the steam. 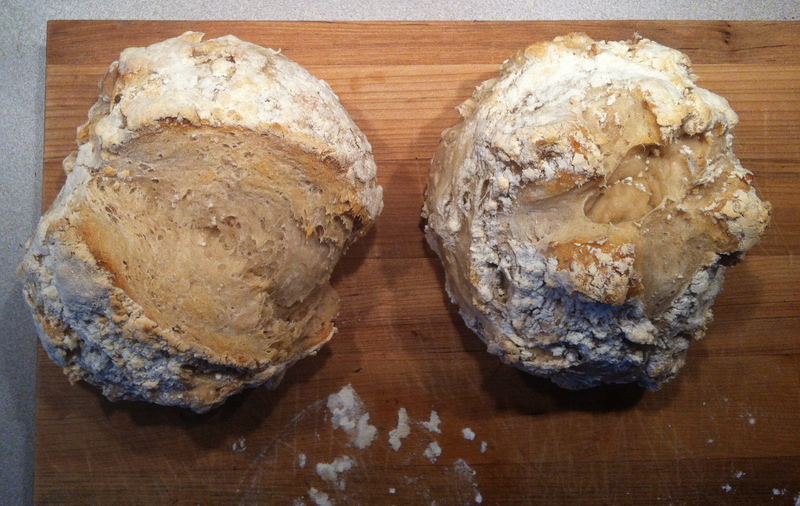 I think it’s the steam that gives the bread that awesome crustiness. In 30 minutes, take that bread out and enjoy it. The weather here is torturous — completely and absolutely torturous. No, there’s no snow or ice on the ground. I’m not snowed in. I’m not stranded. My heat is working just fine, and my television hasn’t been cut off (yet). Rather, it’s frigid outside and the wind is beyond blistering. It’s been this way for days and we both know what happens when it gets this cold: I want to eat everything. My poor conservation coworkers have to listen to that mantra over and over and over again. I want to eat everything. Yesterday, I woke up and decided that it was high time to put one of my favorite Christmas presents to good use: my cast iron frying pan. Of course, on the drive back to Philadelphia, my grandmother admitted to having three of them, each heavily seasoned, which I would have loved so much more than getting my hands on a brand new pan… But don’t take that to mean that I’m ungrateful for the one my brother bought for me. Hardly. I couldn’t wait to use it! Thus, an unwarranted trip to the grocery to pick up some avocados and cottage cheese. I was knackered after a short walk to the store, lugging home a $50 load of fresh food (how some people can pass over fresh food at its peak absolutely baffles me). I whipped up a batch of guac with the surplus of fresh avocados I purchased (80 cents for six not-quite-rotten fruit), and settled into the couch to go through my hoarded magazines from the past year, ripping out my favorite images, articles, recipes, and advice, so I could pitch the rest. 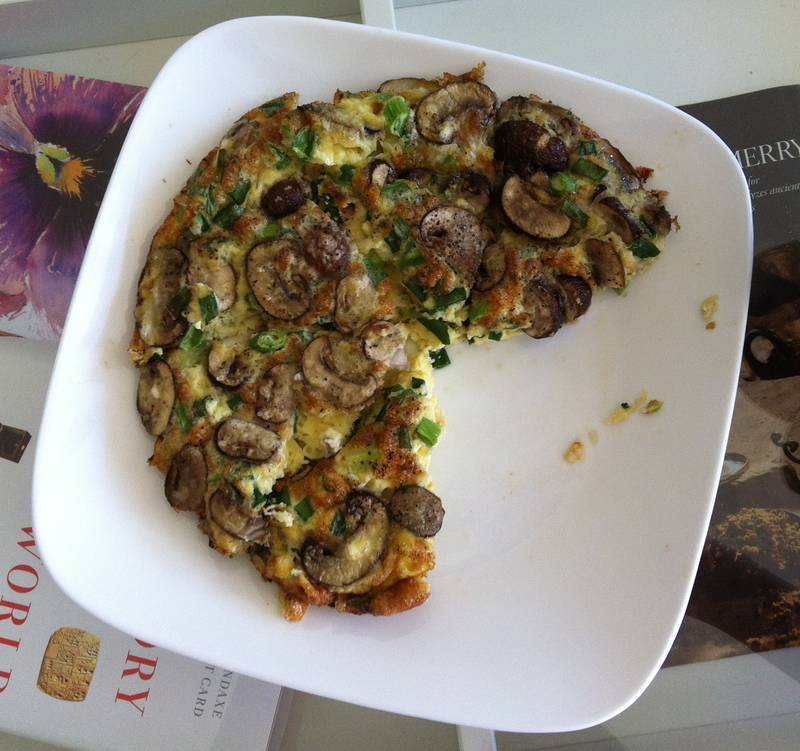 Thus, yesterday was not a good day for making a frittata. It was, however, the perfect day for reading, deep-cleaning the apartment, organizing, tidying, and movie-watching. Passing out in a clean bed with a book in hand around 2 am was most definitely well earned, I think. But this post isn’t about how lovely and productive I am, is it? Well, not necessarily. I don’t have much to say about this first blind stab at making a frittata, aside from a strong insistence that one use a clean broiler for the last step. All too late, I realized that the previous tenant had never cleaned the shelf in the broiler, where she had made some sort of awful, oily, fish-based thing. There was smoke everywhere, a terrified cat huddled under my desk to watch from a safe distance, and a great deal of mid-morning cursing. In the end, I managed to wiggle the shelf out and rest the pan on the very bottom of the broiler (the heat source comes from above in this one). It’s a little over-done, but it’s certainly a beginning. 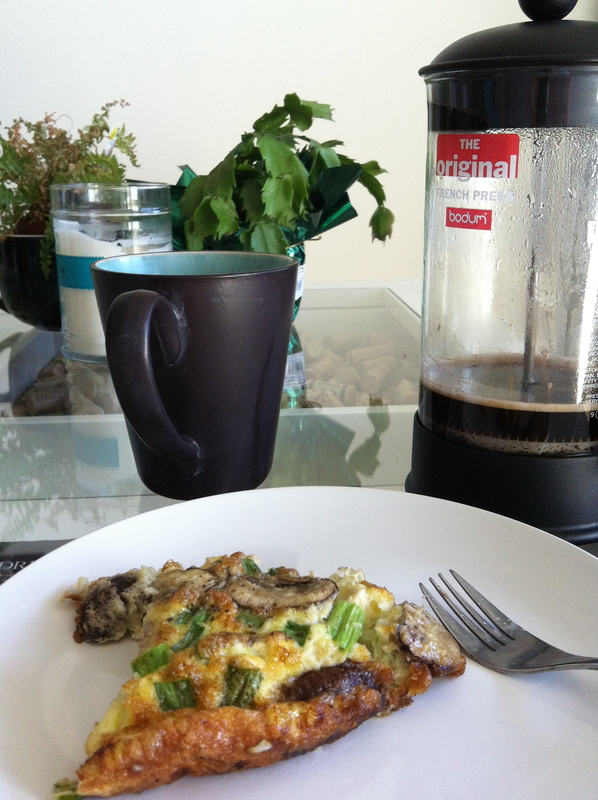 Hopefully the frittata planned for next Sunday will go considerably better. Preheat the broiler and warm the cast iron (or other stove- and oven-safe container) skillet with olive oil on medium heat. Whisk together eggs, egg whites, and cottage cheese. 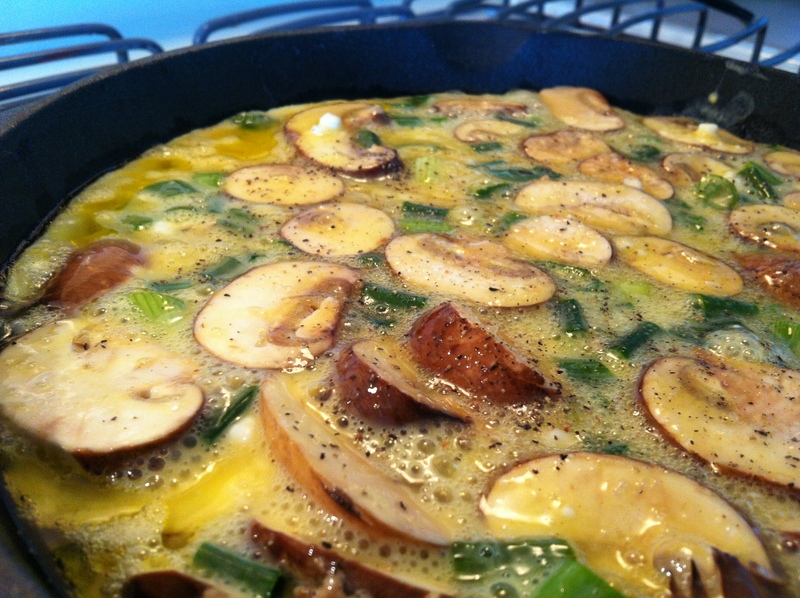 Add scallions, mushrooms, salt and pepper, and cook on stove until eggs begin to set (3-5 minutes). Relocate to broiler, until the frittata appears to cook through and the top begins to brown just a touch (another 3-5 minutes). Remove from broiler and use a flexible spatula to separate the egg from the edge of the pan. Slice into wedges and serve. Important Note: If you have a glass-top stove, do not use a cast iron skillet! You will ruin your stove! Use an oven-safe stainless steel pan, or something similar. 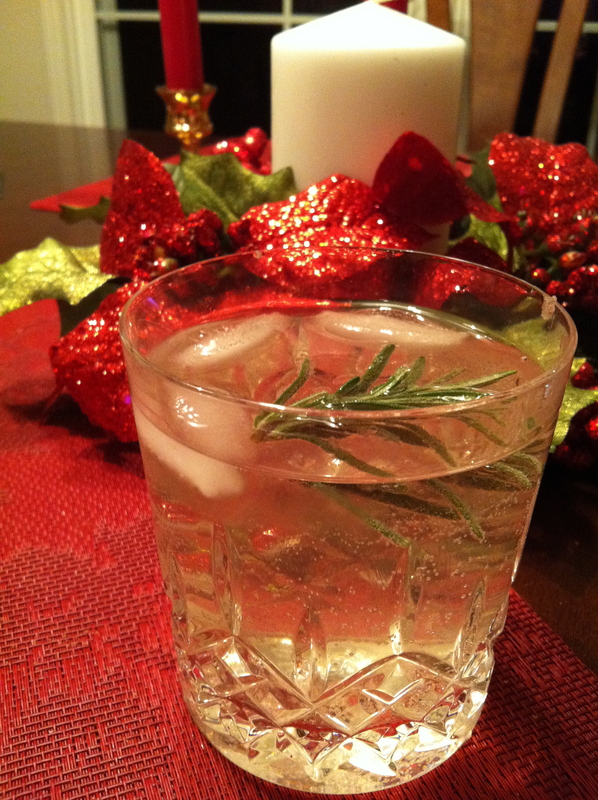 A while ago I promised you a delightful drink that would drive you stark raving mad. Well, maybe not the raving part, and it really was quite a while ago, now that I think of it. This drink is meant to drive you absolutely mad, in the most delightful way possible. One of my very few complaints about the holidays is the heaviness of it all. I’m almost sure to drag myself back to Philadelphia weighing a few pounds more than I had when I left, and while the food is delicious and the company is fantastic, and while I really do wish I could stay home forever, in this lovely holiday limbo — well, let’s get real. In a desperate attempt to steer myself away from some of the thickest eggnog in the world, and keep a pretty white smile by dodging the liters of mulled wine out there, it doesn’t really leave much in the way of holiday drinks, does it? My friend Amy would argue that Stingers (“An old-timey drink with whiskey and creme de menthe. It’s green!”) might offer one alternative, but I do beg to differ. With this in mind, I poked around in my mom’s fridge today, for some inspiration. I’m big on smells, if you couldn’t tell from previous posts. No matter how clean a room is, it doesn’t feel clean enough until it smells clean. No matter how warm it is, it doesn’t feel like summer until you can smell your neighbors grilling hamburgers and sausages. A car is never quite as new as it is when that new car smell overwhelms you every time you open the door. 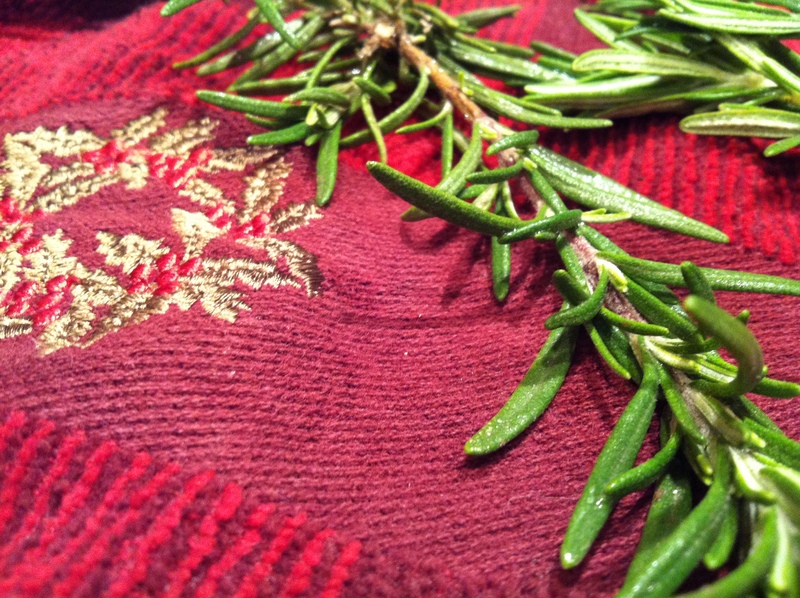 It’s the same with Christmas, so in order to make a Christmas drink, it only seems right to use a smell that matches the holiday. I must have done something wrong. I cannot believe that it would have gotten such acclaim on other foodie blogs if it weren’t absolutely mind-blowingly delicious. I must have done something wrong. 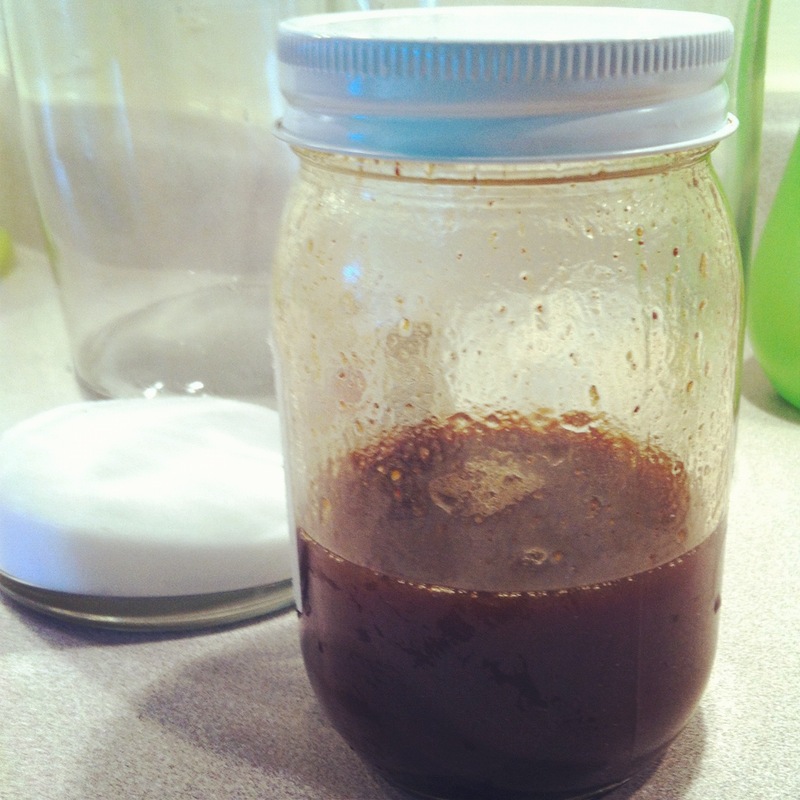 So I made more simple syrup. Remixed. Retried. 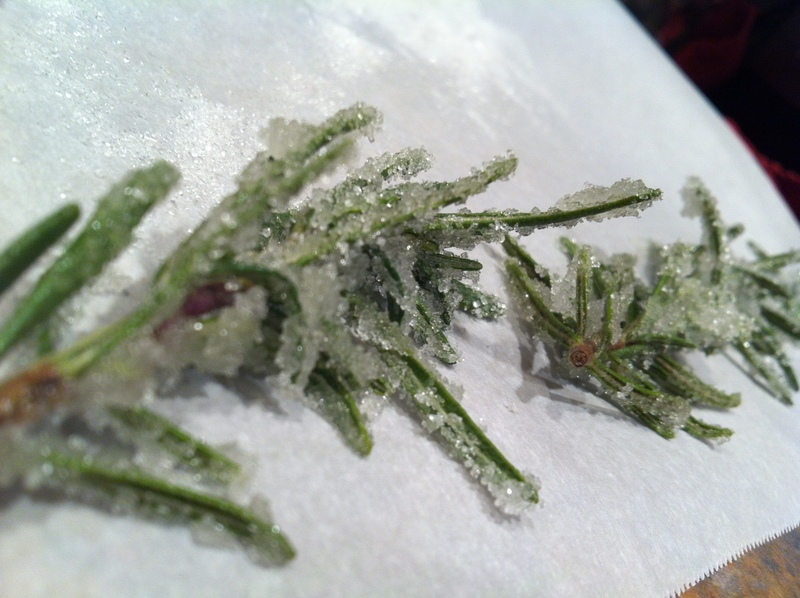 Candied the rosemary. 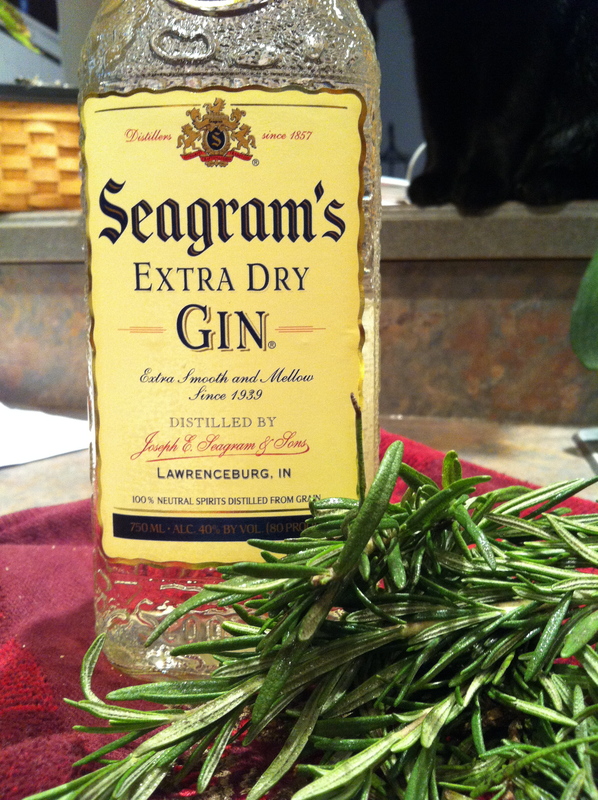 Cut down on the gin. Added more fizz. Upped the sugar content. Downed another one (with a rather pained expression). I must have done something wrong. I must have done something wrong. 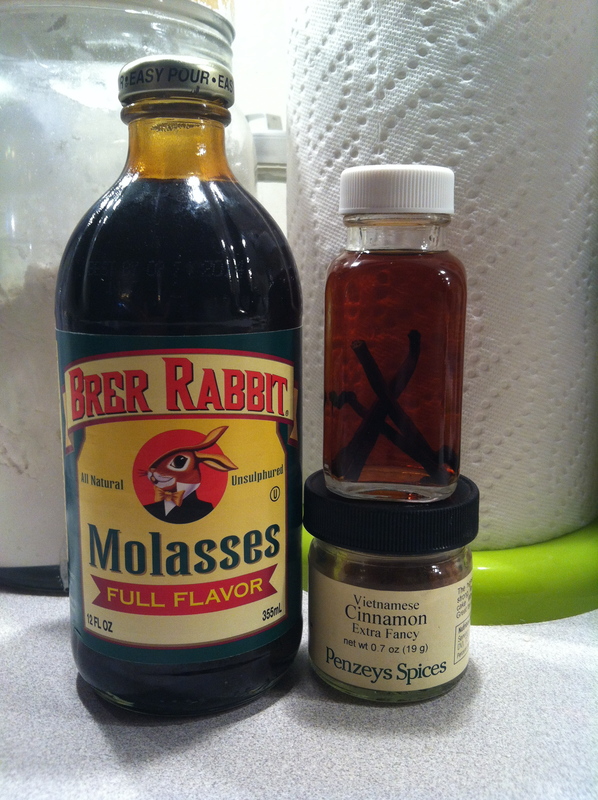 So here, I present to you, the link to the recipe for this drink. Good luck. Measure carefully. And, of course, merry Christmas! Oh hello there. Did you think I forgot about you? Silly you. Let’s play a little catch-up: The end of my first year of grad school was more than welcome by the time it hit, which was — of course — just in time for bolting off to get some archaeological work in abroad. It was such an adventure, I can’t even begin to explain it here. Maybe I should devote a second (often forgotten) webpage to my travels. Ha. From Crete, it was back to the UK for a splendid two weeks with some of my favorite people on earth, and then a mad dash back to Indiana for a few days before zipping up to Canada for my Uncle Bill’s wedding. Honestly, that was the highlight of my summer. Canada itself is wonderful, but I finally got to meet (and remember) all those people that mom and grandma always talked about spending every summer with, matching names to grinning faces. We stayed in a little cabin on a lake (surprise!) for nearly a week, ate sandwiches almost every day (mmm! ), and just spent time with the extended family. I can’t think of a better way to end my summer. Then I moved into a new place and spent the rest of August working. Whew! Now to make up for lost time. 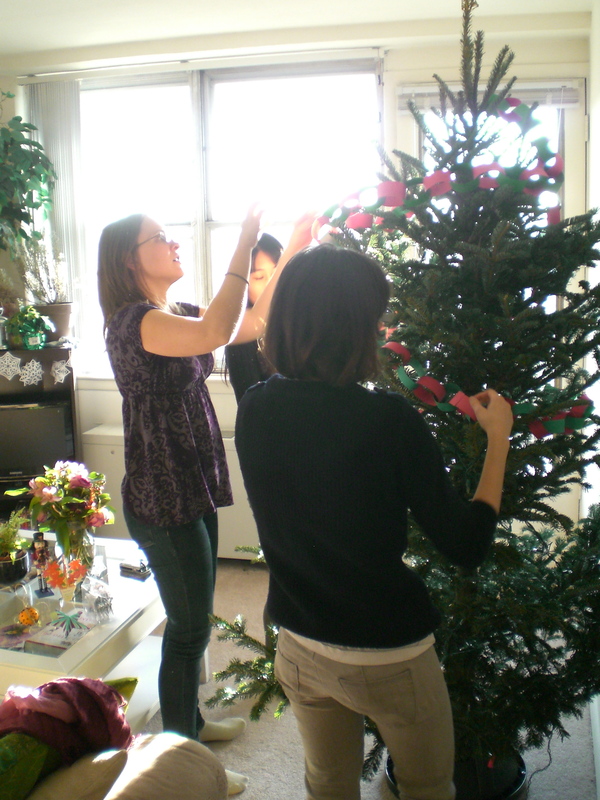 I do have photos of my mini-Thanksgiving coming, since I hosted my immediate family this year! Dad was the photographer, so expect a different style when those photos get thrown up, here. The photos you’re about to view are from this weekend’s baking extravaganza and my crafternoon with a few girls from the department. Last weekend I was lucky enough to have my own Canadian haul a real live Christmas tree up to my apartment (how he wiggled it into my car, I’ll never know), only to realize that I had neither lights nor ornaments. Solution: Crafternoon! 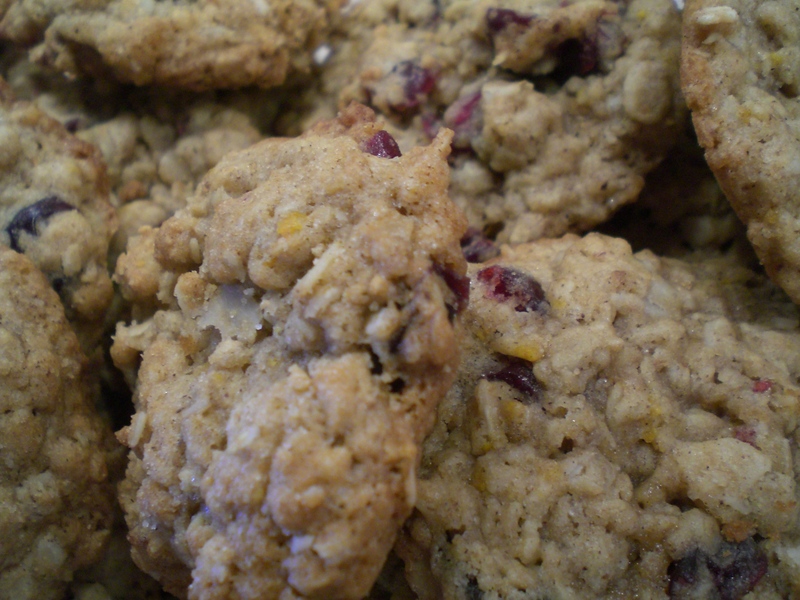 I don’t want my slave labor to go hungry, so the logical answer was to whip out some Thanksgiving leftovers (It’s more than a week later and I’m still working on the turkey), and bake any and everything that occurs to me, beginning with Cranberry Orange Cookies and Sugar Cookies. 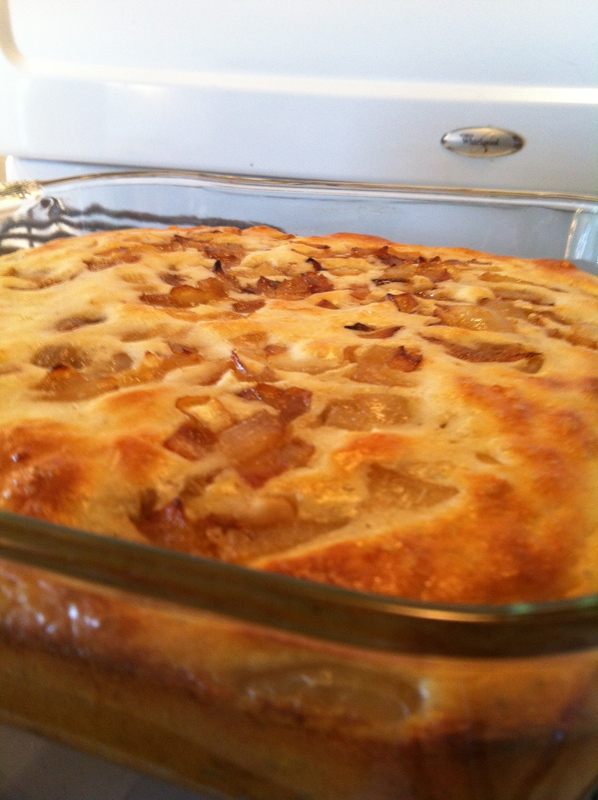 As if making an insane number of cookies weren’t enough, I woke up this morning and just had to make (a cheap, shorthand version of) Deb’s Caramelized Onion and Goat Cheese Cornbread (smittenkitchen, folks). Yesterday I was also smacked with the realization that my mom had secreted away several apples and some pears into the crisper of my fridge, so something absolutely must be done with those. What exactly, I’m not yet sure, but you will probably find out later this week. Allow me to renew my vows, yet again, to post more often. No more 6-month-long silences. I promise. 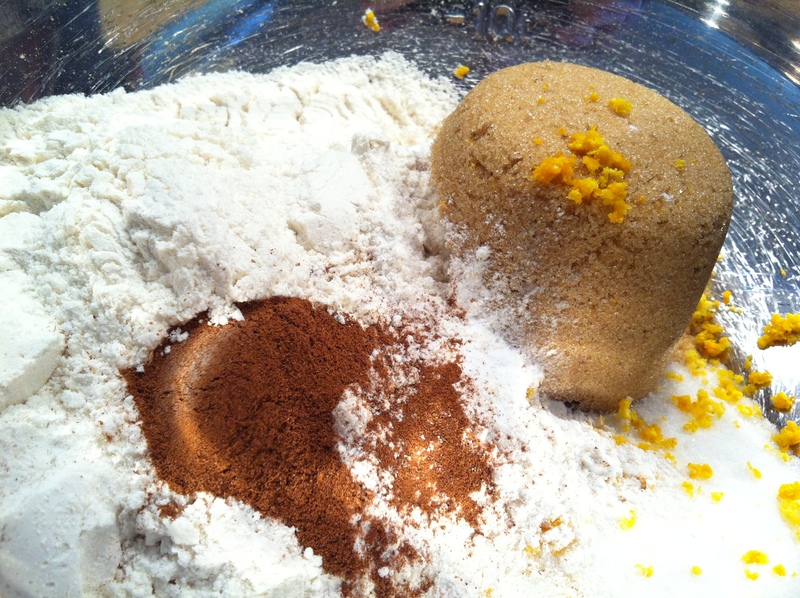 Combine all dry ingredients in a medium mixing bowl (from the brown sugar on down the list). Give it a quick stir. Trust me. Add all of the wet ingredients (from the top on down to the orange juice) and mix well. Spoon equal portions onto a wax-papered cookie sheet. Bake 10-12 minutes per batch. 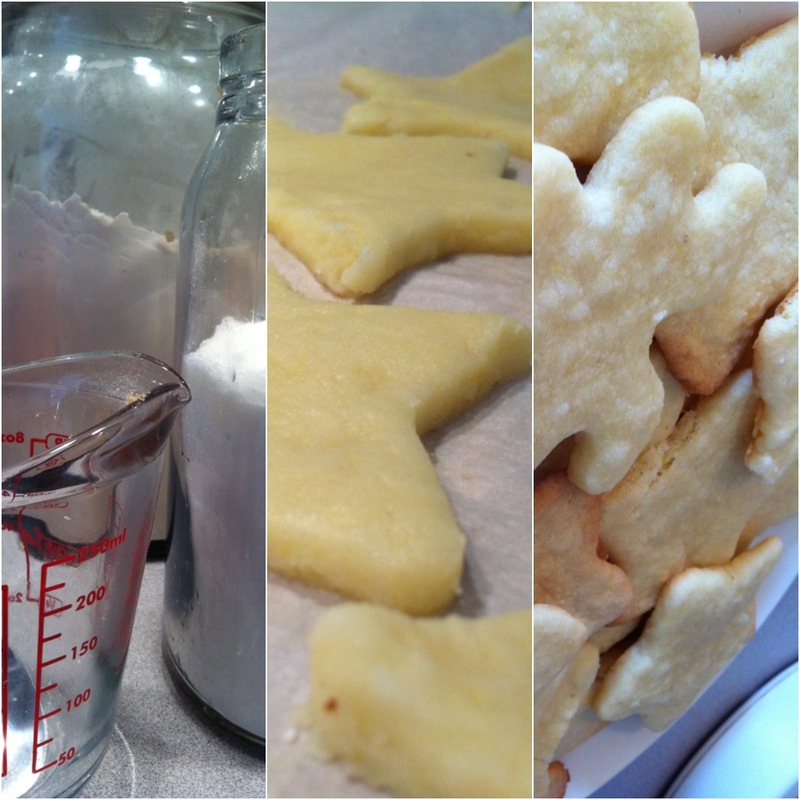 Allow to cool for 2 minutes before moving the cookies to a cooling rack or plate. Keep going! It took me 4 or 5 rounds in the oven before all of the batter was gone. Melt 2 tbsp butter over medium heat. 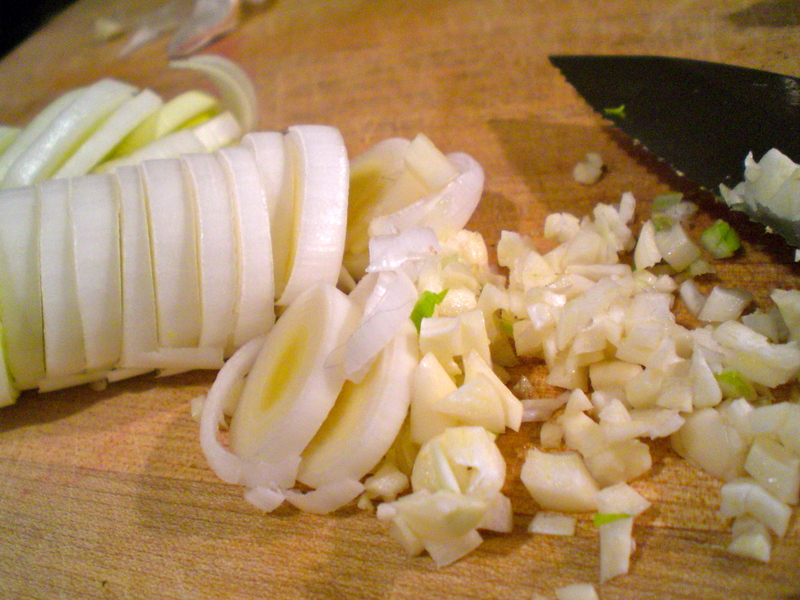 In the mean time, chop/dice the onion. 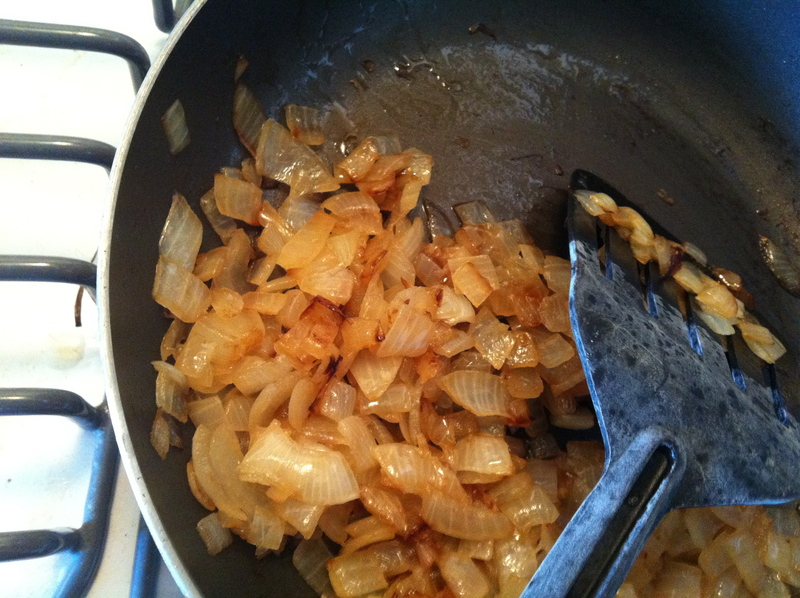 Caramelize the onion over med-low heat (10 minutes, give or take). Set it aside. 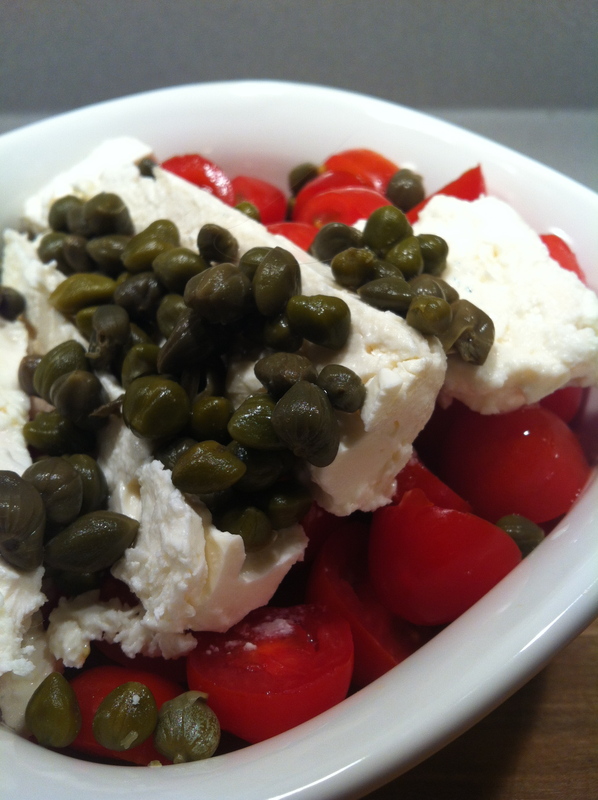 Break up/whip the goat cheese in your mixing bowl. Add the egg and milk, and keep stirring. It’s going to look pretty icky, but just keep going. Add the box of cornbread mix (unless you have your own cornbread recipe). Keep mixing. Drain the can of corn, and add it to the mixture. Keep mixing. Add half of the caramelized onions and 2 tbsp sugar. Keep mixing. Dump it all into a greased pan and top with the remaining onions. Pop it into the oven for 20-30 minutes, or until the top is golden-brown. Let that thing cool for at least 5 minutes before you dig in! Do you remember that commercial that aired a while ago? The one that started by demeaning people who enjoy coming home to cook, in order to convince the intellectually-starved masses that a frozen, preservative-ful meal was better than anything that could be accomplished with a few minutes of slicing or chopping? Yes, that one. I hate that commercial. The fact of the matter is, sometimes I need that 20 minutes of chopping while I wait for the water to boil or the oven to warm. I need to balance, hip against the counter, one ankle tucked behind the other (yes, almost flamingo-style), and pick up that danger of a knife my brother gave me, and chop something to bits. 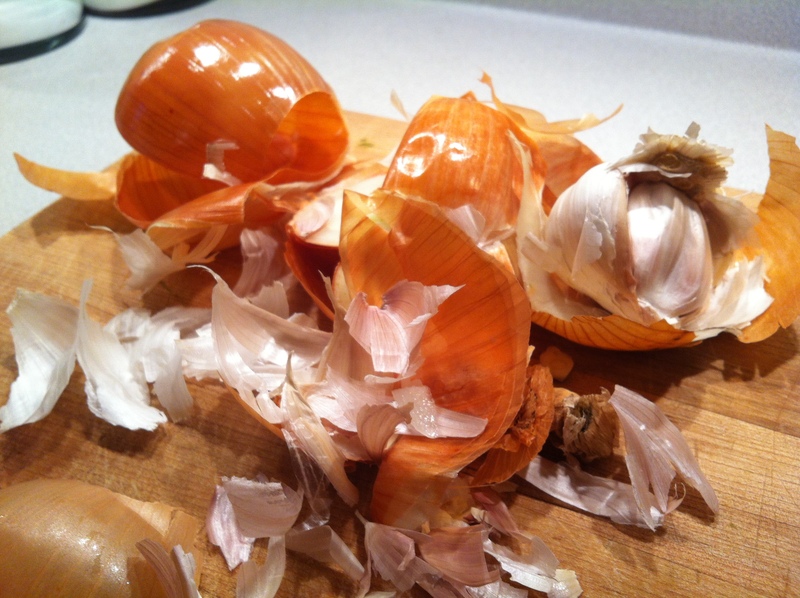 Usually garlic falls prey to my careful, almost obsessive chopping. Sometimes it’s the long, relatively slow draw of the blade through a leek that satisfies me. Well folks, tonight, it was both. With my white-and-blue dishrag tossed over one shoulder, I chopped and sliced my way to oblivion. And wound up with way too much garlic. 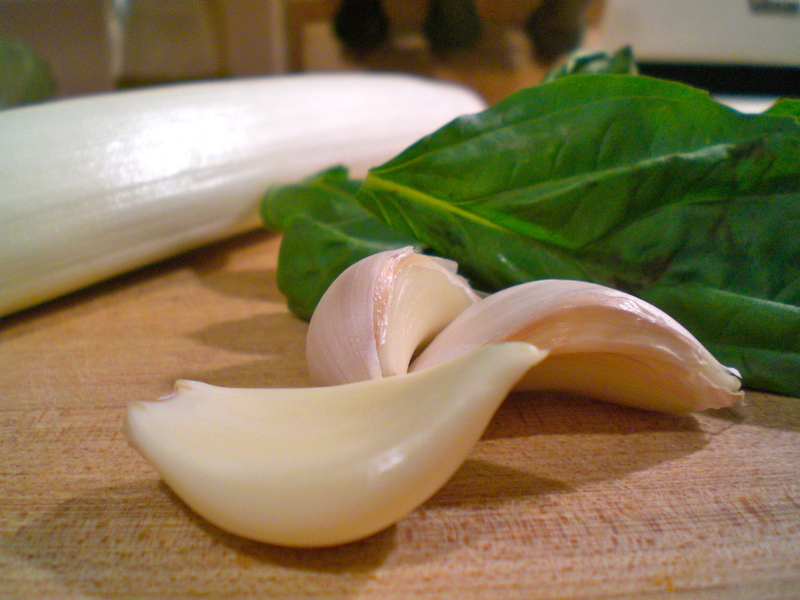 I suppose that’s the story of my life: too much of a good thing leads to … well, too much garlic. When life gives you too much garlic… make enough food for an entire week’s worth of lunches. Alright, so that doesn’t have quite the same ring as the bit about lemons, but it fits the situation. Speaking of the situation, I’ve been doing some things lately that I shouldn’t, like ignoring the need to post more. I know this is something I say every month, when I renew my vows to bring you new, delicious meals and show up with another crumble or “crap on” recipe (tick pasta and toast off that list), but I do promise, just as soon as this scholastic sprint to the finishline is over, I will give you seven perfect days of seven perfect posts. We’ll cover the lot of it: breakfast, lunch, a delightful snack, appetizer, dinner, dessert, and a drink to die for. I promise. Hang in there, homies. Chop the garlic, slice the leek. Toss ’em into a pan on medium heat with the olive oil. Toss in the pasta for 4-5 minutes while you finish sauteeing the leeks and garlic. 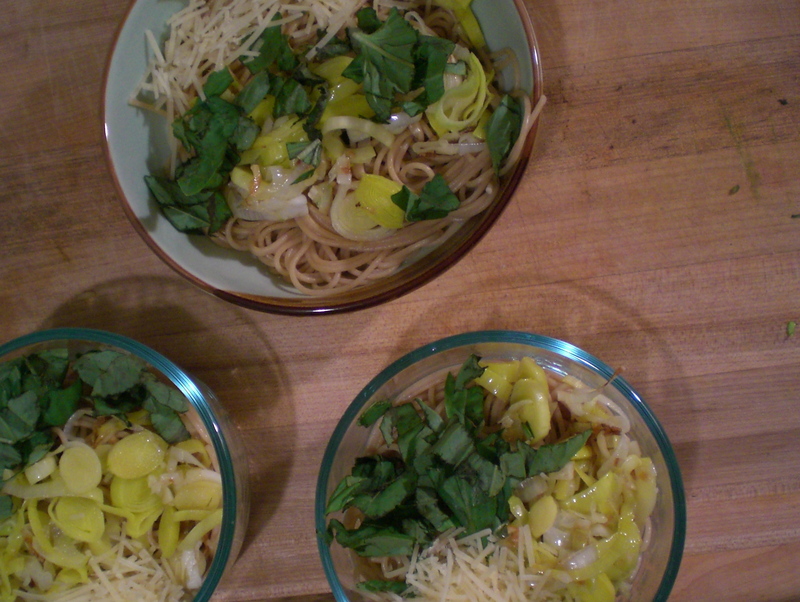 Drain the al dente pasta, toss the leeks and garlic on top, then the basil, and dust with parm if you like. Ideally, you’d be listening to some Iron and Wine and drinking a little wine while executing the tasks above. Mmmm.